September 17, 2009, North Dakota, Bear Aircraft launches the Bear 360 Aircraft. A all metal, high-performance, 360 HP radial M-14P powered, tandem seating, Warbird styled aircraft. 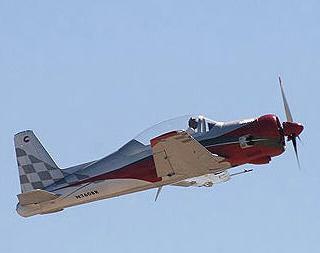 Created by the American-Russian international design team that includes Russia’s most prestigious aircraft designer, Sergey Yakovlev, and America’s most experienced combat fighter pilot and world champion air racer, Skip Holm, the Bear 360 represents an exciting breakthrough in high performance aircraft design and manufacture. The Bear 360 is a high performance two seat all metal low wing monoplane reminiscent of classic World War II aircraft like the Bearcat, Hellcat, Yak and other radial powered aircraft of this era, with a blistering 210 knot cross country performance (based on the 420 hp optional M14PF), exemplary aerobatic capability and excellent formation handling characteristics. The United States and Russia represented by two of the most formidable aircraft manufacturers of our age, joined forces to collaborate on the design and manufacture of this outstanding sport aircraft, the Bear 360. Sergey Yakovlev, through his experience and Russian heritage with the famous Yakovlev Design Bureau, developed the Bear 360 in the tradition of military specifications, quality design and a historical set of standards. Sergey Yakovlev, chief designer of the Yakovlev-Bear design team, designed the Bear 360 to meet stringent FAR Part 23 requirements as well as full Russian Military Specifications. Furthermore, with over 1,000 hours of wind tunnel and load testing to destruction, the Bear 360 has also undergone extensive flight-testing to US military standards in the expert hands of test pilot Skip Holm. With this dossier, the Bear 360 has been issued FAA approval. These design standards encompassed requirements for excellent takeoff, landing, and in-flight handling characteristics; coupled with outstanding aerobatic and formation handling capabilities for air show and racing operations. Additionally, the requirements also specified having a 210 knot cross-country capability plus low costs for ownership and maintenance. The result is the amazing Bear 360. The Bear 360 reflects the world-class experience that Sergey Yakovlev and Skip Holm bring to this exciting new breed of high performance aircraft. The Bear 360 has a sleek and aggressive profile. It is the modern reincarnation of the mighty American and Russian warbirds of World War II such as the Bearcat, Hellcat, and Yak. If your heart beats a little faster every time you see a Warbird and hear the throaty roar of a mighty radial engine -- this is the aircraft you’ve always wanted. The Bear 360 aircraft is a high performance all metal low wing monoplane. Its large two place tandem seated cockpit has ample visibility and dual flight controls. Instrumentation in the front cockpit is current US technology avionics, including GPS. Sold in the experimental category, the Bear 360 meets specifications for this type of FAA aircraft category and is a fully documented FAR Part 23 engineered aircraft. It has undergone over 1000 hours of wind tunnel testing in a certified testing tunnel. It has been load tested to destruction in a certified structural testing facility. It has been flight-tested to US military aircraft industry and FAA industry standards by a US test pilot. The Bear 360 is powered by the Vedeneyev M-14P, 360 horsepower, supercharged, air-cooled, reciprocating nine-cylinder radial engine. The M-14P is becoming commonplace in the US and is currently being used on numerous aircraft sold in the USA, such as the Sukhoi SU-26, SU-29, Yakovlev Yak-12, Yak-18, Yak 50, Yak 52, Yak 55 series aircraft, American manufactured aircraft such as the Pitts Spider and various agricultural aircraft and kit aircraft. The M-14P is supercharged and will maintain sea level power to 7,500 ft altitude. Engine controls are simplified through fuel scheduling hardware so that the pilot operates only the throttle and RPM controls. Engine starting is electric. Vedeneyev dictates the M-14P’s TBO in terms of cycles, which is a common practice in Russia and Eastern Block countries. In the West and Europe’s JAR it has certified the engine for a 1500 TBO. Bear Aircraft maintain a fully stocked parts and maintenance department for the M-14P and Bear 360. The Bear 360 has a three bladed hydraulically controlled constant speed MT Propeller that has been engineered and certified to meet FAA specifications. The Bear 360 wing has a NASA 63-215 root and 63-412-tip laminar flow airfoil selected to provide low drag, good low speed handling characteristics and excellent stability to high angles of attack. Lateral stability has been demonstrated in the full wind tunnel to 30 degrees angle of attack with flaps full up or full down. The wing is constructed around a massive single piece tapered main spar with stressed aluminum flush riveted skin over conventional stamped aluminum ribs. Wing dihedral is 5.0 degrees. Fuel is contained entirely in the wing structure and no bladders or individual tanks are used except the center sump tank, which feeds the engine (An auxiliary external centerline fuel tank is also available on all aircraft). The landing gear system attaches to the main spar and its surrounding structure. The wing is attached to the fuselage as a single piece structure and the four attach points are precision machined so there is no special rigging required for wing removal/replacement. The Bear 360 flight control surfaces are all-metal construction and mass balanced so that there is no possibility of aero elastic instability throughout the approved flight envelope. Flight control actuation is through torque and push - pull tube assemblies; no cables are used. Trim on all three axis is electric. Controlled with standard individual push-pull controls. The Bear 360 fuselage is semi-monocoque, all metal, flush riveted construction. The cockpit area offers excellent visibility for both occupants and accommodates 96% of pilot sizes. The cockpit width at the sliding rails is 25.5 inches. The windscreen is heavy 3/8ths polycarbonate for safety, and the canopy is a large unobstructed bubble offering maximum ground and in flight visibility for both occupants. The canopy slides aft, operated by a hand crank, which is very similar to that of a P51 Mustang. Furthermore, the canopy may be left partially open during start, taxi, takeoff/landing and pattern operating speeds. The landing gear is conventional, retractable, including the tail wheel. The main gear track is 9.3 feet affording excellent stability and handling in ground maneuvering and good controllability on takeoff and landing, including crosswind operations. The main gear struts are oleo-pneumatic accommodating 8.00X10 inch tires. The brakes are of US manufacture employing two actuation cylinders per brake rotor. The tail wheel is steerable and pivots through 360 degrees for ground handling/towing. The landing gear is either hydraulically or pneumatically operated. An electro-hydraulic pump provides hydraulic power. Pneumatic power is provided through a pneumatic reservoir recharged automatically in flight by the engine driven pneumatic pump. Emergency landing gear extension is by means of an air charged unlock of the over-center locking mechanism. An additional extension option, through a manual unlock of the main gear up locks (similar to a P51), allows a gravity/aerodynamic actuation of the main gear to a down locked position. The landing gear system normal operating pressure is nominally 800 PSI. The Bear 360 electrical system is 28 volts and is charged by a 35 amp B&C Specialties SK35 engine driven alternator, and a 24 VDC battery. The fuel system consists of three wing fuel reservoirs, an engine driven fuel pump, and an emergency electrical fuel boost pump. Wet wings accommodate 37 US gallons each and the sump/feeder tank in the bottom center of the wing holds the remaining 2 gallons of the fuel system, for a total of 76 gallons. For normal operations the fuel boost pump is not required as the engine driven mechanical fuel pump provides both the suction to pull fuel from the sump tank as well as pressure for normal fuel scheduling throughout the engine operating range. The fuel boost pump provides full normal engine operation for starting, takeoff and landing. Additionally, an optional removable 20 US gallon centerline mounted external tank, similar to a WWII drop tank design, is available for all aircraft. This external tank fuel is delivered via an electric fuel pump. The flaps are electrically actuated, via an electric flap switch and can be manually stopped at any flap position. This 3-position flap switch commands flaps in these positions: flaps up, flaps stopped, or flaps lowering. An electrically actuated speed brake is mounted near the aerodynamic center of the aircraft between the flaps. The speed brake can be employed throughout the entire aircraft flight envelope with minimal change to steady state trim settings. The speed brake can also be employed as a flap for landing. The cross country baggage compartment or equipment bay is 4.2 cubic feet and is designed to carry airline carry-on-baggage for both pilots. It will accommodate up to two roll-around travel bags and two hang-up bags or equivalent in equipment and is limited to a maximum of 75 pounds.